Banana bread reminds me of my mother. This isn't because it's both comforting and sweet, like my mom [it is and she is]. 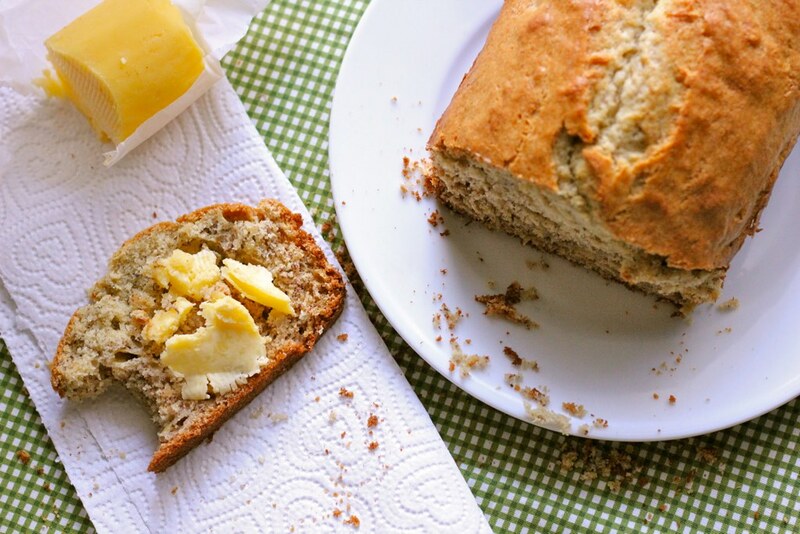 Rather, banana bread reminds me of waking up on Saturday mornings to the house smelling like buttery, banana goodness. During the week my mom left for work before my sister and I got up for school, so weekends and days she had off were special. On those days, we got my mom's undivided attention. And, more than that, she baked us banana bread (whoops...did I just say that? sorry, mom! love you!). My sister and I were never morning people. Our dad got us up for school on weekdays with the help of the radio and the threat of a spray bottle. Yet somehow, all it took was a few ingredients and an hour in the oven for Amy and I to hop out of my bed on weekends. We'd plod our pajamed legs across green linoleum and plunk ourselves down at the table with tired anticipation. Waking up and waiting was always a gamble. Sure, there was a good chance that we'd be rewarded from our early-rising with a hunk of banana bread still warm from the 350 degree oven. But, there was always a tiny chance that my mom would try to make things more healthy for us by sneaking in something like nuts or bran, neither of which were welcomed by our palate. While my mom carved the loaf at the stove, we crossed our fingers, hoping to see the simpler version in front of us--crisp top with a dense cake interior streaked with tiny black banana squiggles. "Please, no bran. Please no bran," we prayed. Mostly, my mother heeded our request. The morning could start on a happy note. This week is particularly stressful for a number of reasons. I'd love nothing more than to wake up and find a loaf of my mom's banana bread waiting for me in the kitchen (yes, even with nuts, though bran might be pushing it...). But, being that I'm four hours away, I know that's not a possibility. So, to bring a bit of comfort during a hectic week, I thought I'd bake some of my own. I wanted to jazz up the recipe a bit, so I added brown butter. This made for a nutty flavor, but the loaf was smaller than usual. By my third slice (hey! don't judge. They were small! ), I thought, "It's too bad this wasn't more portable and conducive to stress-eating." Then suddenly, the idea hit me--madeleines! The tiny shell-shaped cakes would allow me to keep the texture I love and let me take them anywhere without a crumby mess. 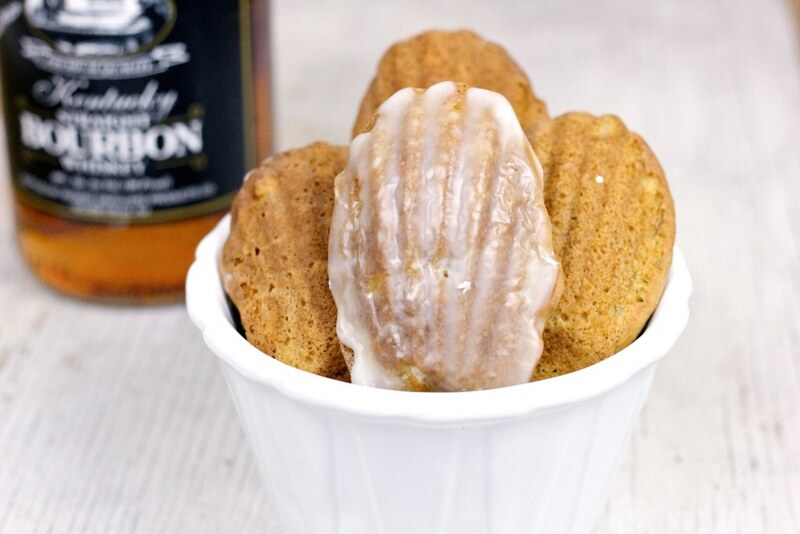 And because my favorite madeleines are glazed, I thought bourbon made for a nice touch. Brown butter banana bread madeleines with a bourbon glaze. Adult. Individualized. Boozy. Perfect portable comfort Make a batch. Go on. Eat your feelings. I won't tell! In a small saucepan, melt butter over medium heat. Cook until milk solids separate and begin to turn brown. Remove from heat. 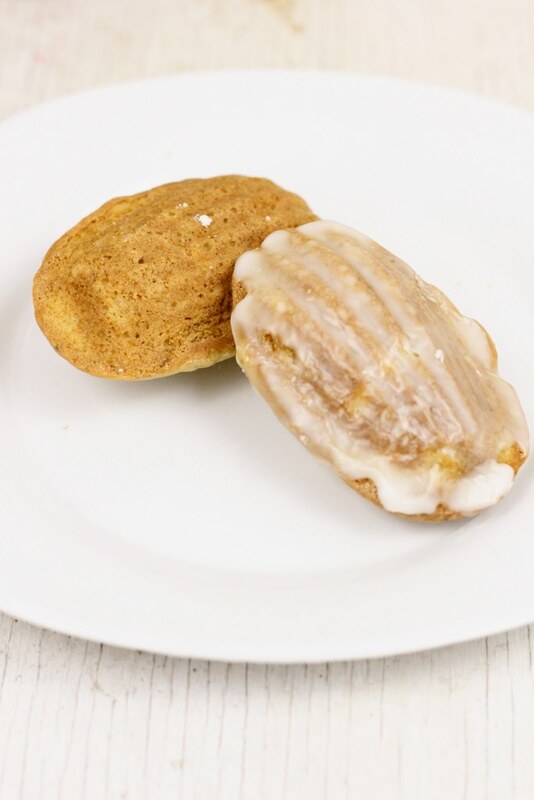 With a silicone pastry brush, lightly brush two madeleine pans with brown butter so that they have a very thin layer of butter in each shell mold. If you have too much butter, it will form a puddle in the crevices of each shell. Dust each buttered pan with 2T of flour, shaking out excess. Set aside. In a stand mixer, beat 2 eggs with sugar on medium speed until pale yellow and thick ribbons form when the beater is lifted, roughly 3 minutes. Combine flour, powder, soda, salt. Add to egg/sugar mixture in two separate batches, alternating with the mashed banana. Slowly drizzle in remaining brown butter and stir until combined. Using a small cookie scoop, scoop roughly 2 teaspoons of batter into each shell of the madeleine pan. [These cookies spread and rise quite a bit, so it may seem like you haven't added enough batter. If you're super hesitant, you can always do a test run by baking 1 or 2 cookies]. Bake until cookies rise and form a signature mound and turn slightly golden around the edges, roughly 18-20 minutes. While cookies are baking, combine confectioner's sugar, bourbon and vanilla, add just enough water to reach a thin consistency that just coats the back of a spoon. Stir until lumps are gone. Set aside. Once cookies are baked, immediately remove cookies and place onto a cooling rack. Quickly dip each cookie in the bourbon glaze. Place on cooling rack to set. Store uneaten cookies in an airtight container.